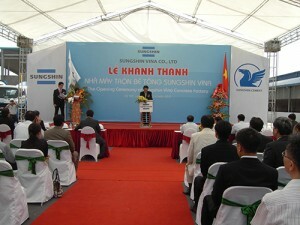 Address: 25th floor, Keangnam Landmark 72 Tower, Plot 6, Phạm Hùng, Từ Liêm, Hà Nội. Lại Yên Industrial Zone, Lại Yên commune, Hoài Đức district, Hà Nội. With concerns of any issues including Sale, Technology on ready-mixed concrete production, Customer services, Operation, Recruitment…., please do not hesitate to send email to Feedback@Sungshinvina.com.vn. Your concerns and questions will be forwarded to the right person and will be replied properly. Sungshin Vina’s employees can send constructive feedback for the development of our company to the emailFeedback@Sungshinvina.com.vn. You can raise your voice about many different issues: innovative business ideas , ideas to renovate the company’s operation or policies … Especially, you can inform us about the abnormal matters that are negatively affecting the development of our company (see Guide on Declaration).